If you like a book full of mystery, suffering, betrayal, and bravery, this is the book for you. 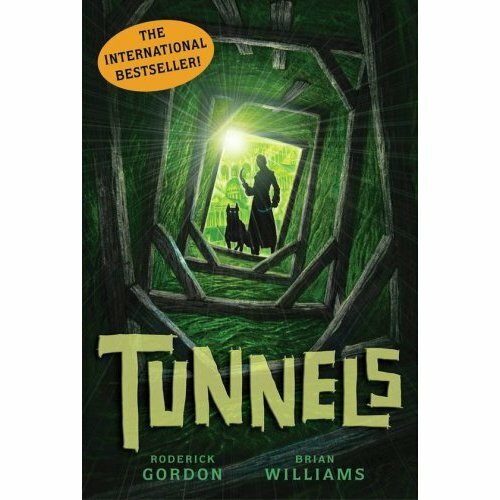 Tunnels is about a family in London that discovers a whole world beneath them. The main character, Will, has to enter this world to find his father, but ends up finding out about his past and his true family. In the process, he ends up having to save other people, including his best friend Chester, from the evil Styx. This book is said to be "the next Harry Potter book". I think this book isn't nearly as appealing as Harry Potter, but is definitely good enough to read. The best part of this book is learning little by little what this underground world is like. It's not a nice world, but it is very interesting. The main character, Will, is also quite brave and curious and the authors do a good job of reminding the reader of these traits. On page 363, Will and Cal are being chased by the evil Styx through the Eternal City when they come across a sight that Will finds fascinatiing. He says, "I'd love to have a closer look." This shows that even when he is frightened and worried he maintains his curiosity. There are two things I didn't like about this book. First, I thought the language at times was difficult. The authors not only use a lot of challenging words, they also use some specific vocabulary about architecture. It's also a British book, and uses some specific British phrases and words. The descriptions can be hard to follow, such as on page 226. "On either side of the road stood rows of buildings, a complex forest of brick ducts running over the cavern walls above them like bloated varicose veins." It's a good example of figurative language, but a little too wordy for my tastes. The second thing I didn't like is the overall meanness of some of the characters. There seems to be no explanation for the meanness, but perhaps we'll get it in the next book. The main characters suffer a lot in this book and at times I didn't want to read anymore because it was just too painful. However, I thought the ending of the book was satisfying because things don't suddenly get better, but there is a glimmer of hope. It would have been awful if after all that suffering everything just went back to normal. I would recommend this book to people who like mystery, discovery, and who can deal with book that is often very sad and very scary.